Getting a cup of coffee over here can be a tad traumatic, because China’s big drink is tea there’s not much in the way of choice and in most of the country if you can find it the only option is Starbucks. Shenzhen is slowly gaining some input from a couple of other chains, Pacific Coffee (a Hong Kong based franchise) and Costa Coffee but there are only a couple of outlets of each and none of them convenient to home. 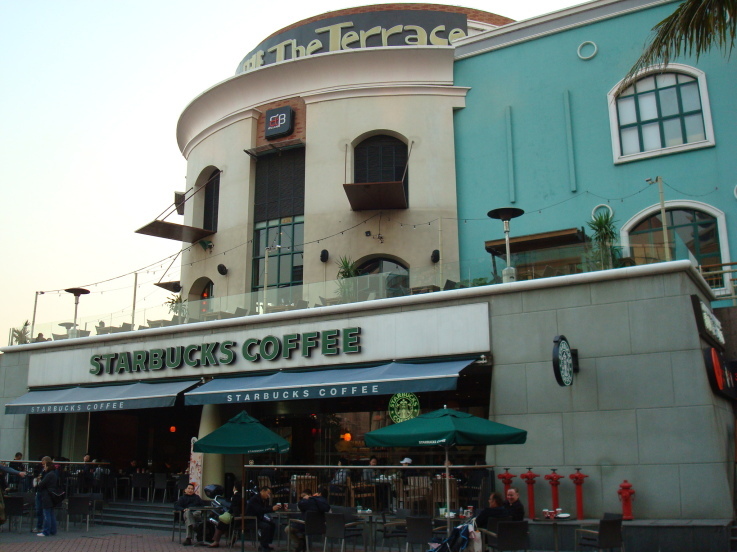 Starbucks is a bit of a rip off on the Mainland, the beverages and the food cost more than they do in Hong Kong and that’s with lower wages and rents here in Shenzhen. In fact the average worker in Shenzhen takes home around 900 RMB a month after deductions, which wouldn’t buy them a cup of coffee and a sandwich every day (they’d run out of money around the middle of the month). So in comparison to local living costs it’s extortion. Having said that, I can’t live without my daily four shot espresso. A bad habit I gained during Ramadan while working in the Middle East (essentially coffee shops close during daylight hours, so we’d get up at the crack of dawn and try and deliver a whole day’s caffeine fix in one hit). And my local Starbucks is a delightful place, staffed by happy young Chinese folk who speak excellent English and brighten up my day immeasurably by recognizing me and having my coffee ready pretty much as soon as I’m in front of the till. Better still it has a nice outside seating area away from a main road where I can smoke to my heart’s content while drinking. Coffee without cigarettes is unbearable and anti-smoking legislation (which does exist) has yet to make any noticeable impact on the Chinese habit of lighting up anywhere they aren’t likely to be arrested for it. Around the rest of the city the experience is not always as good though, thieves regularly prowl coffee shops looking for victims who come in search of free wi-fi (several friends both Chinese and Western have had their laptops stolen in Starbucks). It can be hard to communicate with some of the staff, and woe betide the customer asking for a cold bottle of water (which at 20 RMB a bottle is shockingly overpriced). It’s often almost impossible to get a seat too, as many locals treat any unattended table at any fast food business as the perfect opportunity to hold an impromptu picnic with food they brought from home. Thus gaining “face” for being in an expensive Western style establishment without incurring a bill.